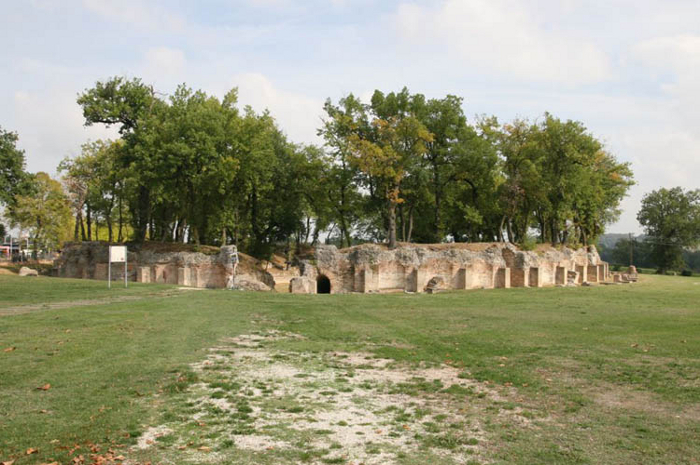 Monte San Giusto boasts ancient origins. 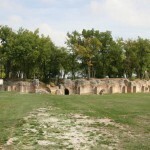 The first settlement dates back to the roman period (Nerva’s Era 96 – 98 B.C.) testified by imperial bronze coins found in the surrounding country side and by the memorial stone on the lateral entrance of the Church of San Stefano. With the Goths invasion in the III century B.C. the urban town of “Mons Iustitiae” was destroyed. Rebuild it was than re-named “Mons Sancti Iusti” in honour of the Bishop of Vienne (France) San Giusto, who visited the town in the end of the IV century. 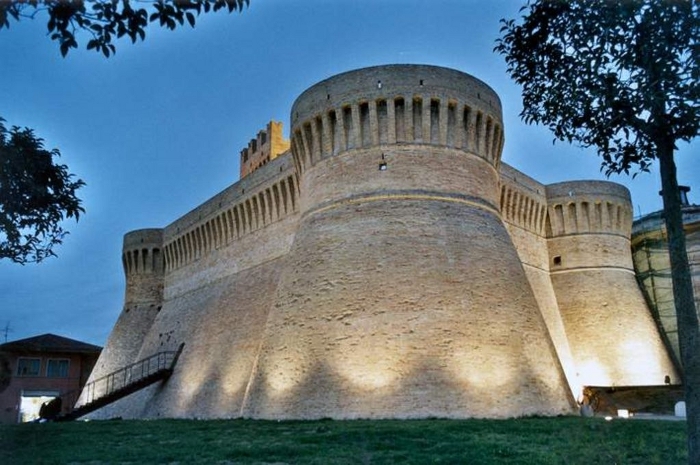 In the late Medieval period the town was re-constructed, city walls were built to protect the town from invasions, still visible today (Porta Romana, Porta della Sala, Porta Damascena ); at Via Circonvallazione a XIV century an embattled donjon can be noted. Monte San Giusto enjoyed its golden age in the 1500s, Nicolò Bonafede born at Monte San Giusto in the year 1463, bishop of Chiusi and official of the papal court, beautified his native town. In the historic centre, Bonafede Palace(1513-24) now the town hall, an elegant building with a brick façade with its Renaissance portal and five Guelph cross windows on the first floor. The interior of the palazzo, which is articulated around a lovely courtyard with two tiers of small windows, houses the Collezione di Disegni di Antichi Maestri Italiani, a fine collection of 16th and 19th century drawings by Italian masters amongst most Alessandro Maggiori . 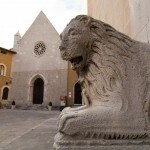 As well as the works of the sculpture Carlo Cantalamessa donated by the Brillarelli family. On a first floor hall known as “La stanza del Vescovo” to be admired are fresco’s attributed to Joannes Hispanus. On the top of a hillock , along the ridge that leads to Mogliano, is La Coriolana, a small fortified 16th century manor-house once summer residence of Bishop Bonafede. On Via Tolomei, opposite the Palazzo Bonafede, S.Maria in Telusiano, a 14th century church that was thoroughly restored in the 16th century at the behest of Bonafede. 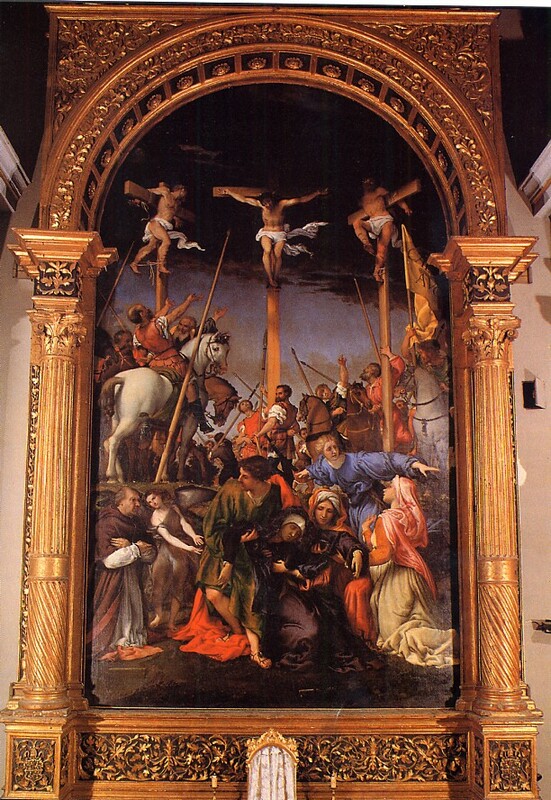 On the high altar is the magnificent Crucifixion by Lorenzo Lotto commissioned by Bishop Bonafede, finished by the Venetian painter in the year 1531. A Truly outstanding masterpiece with its stupendous frame designed by the artist himself . 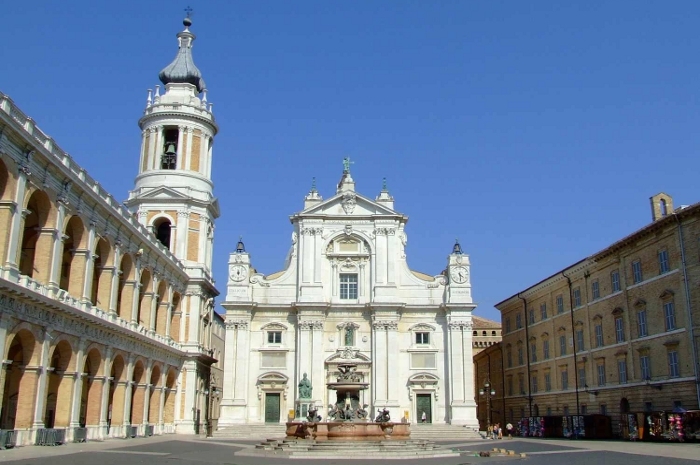 The “Chiesa Collegiata” , the church dedicated to Saint Stephen constructed on an ancient parish of the architect Vassalli opens for cult in the year 1781, conserves a fresco of “La Madonna del Latte” XIV century , a statue of the Holy Virgin of the XVI century and a XVIII century organ. 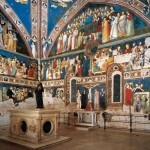 As well as a fresco’s of Pavisa. 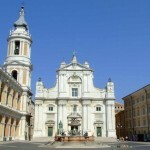 Santa Maria delle Panette, a suburban church of Vanvitelliano’s style, built by Gaetano Maggi in the year 1740. It holds an important icon of the apostles Jacob and John once belonged to an ancient confraternity stall where bread was distributed to pilgrims on their way to Loreto. 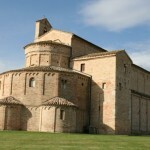 Santa Maria a pié di Chienti Abbey. 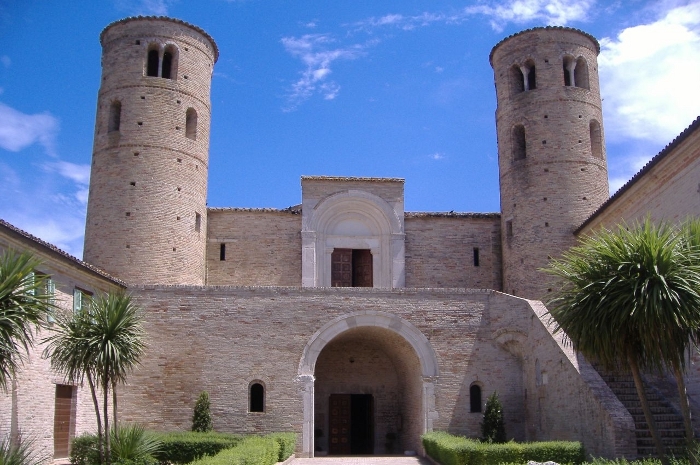 The construction period of this abbey is still unverified, some date it as back as the year 936 A.C. when Carlo Mango wanted it build in celebration of his victory against the Saracens in a village close by. 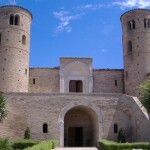 The existent building is considered of the 12th century, consecrated by the abbot of Farfa Arnoldo in the year 1125. The abbey is of a basic construction with three arches and a semi circular apse. The spectacular interior, with a basilica plan and two side aisles is very impressive. The front section of the nave opens out as far as the trussed roof and has two highly original ambulatories on each side, the only of this kind in the region. The mullioned windows are adorned of alabaster panes shading a faint light that becomes rosy by dusk. 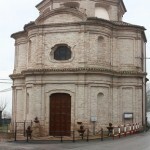 San Claudio al Chienti Abbey. 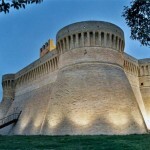 Built in the VI-VII centuries on the ruins of a roman villa it was re-constructed to its present form in the XI century. Unique in the Marches, the abbey has two cylindrical towers set at the sides of the façade, inspired by Byzantine’s architecture. The building is of a rectangular Greek cross shape with three apses on the backside and two on the sidewalls. Holds two churches one on the lower storey defined “plebale” used in the past by normal citizens and the upper part “cappella palantina” used by the noble hood and the clergy. 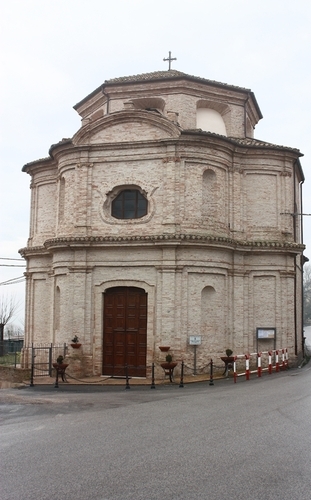 Nowadays the “cappella palantina” is accessible through a wide external staircase. Of great affect is the church’s garden with its imposing ancient cypress. 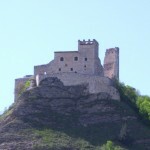 Pallotta Castle. 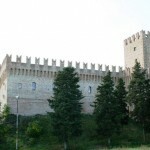 The most noteworthy feature of Caldarola is Castello Pallotta which dominates the town from the top of Monte Colcù. 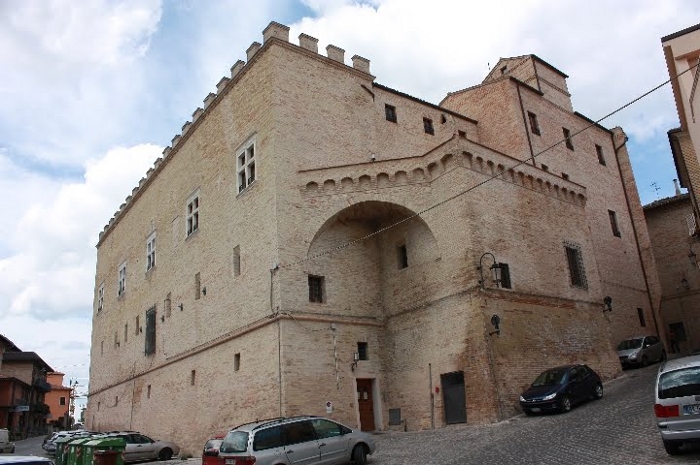 Acquired by Jacopo Pallotta from the Varano of Camerino in the year 1450 , Jacopo Pallotta fortified the castle to protect it from eventual attacks. In the XVI century the Cardinal Evangelista Pallotta transformed the castle in a picturesque residence with an enhancing park. 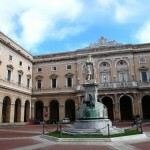 The interior with its rooms, corridors, staircases and galleries adorned of art ware, paintings and fresco’s of the famous painter Simone de Magistris and his apprentices. Sanctuary. The rustic cottage of Nazareth where the Annunciation took place and were the Holy Family lived, so the legend narrates, was borne away by angels in 1291 as the Saracens descended on to the Holy Land. It first arrived on a hill in Dalmatia. Here it stayed until the 10th of December 1294, when it was again miraculously moved, this time across the Adriatic Sea to Loreto. The devotion demonstrated to this Holy House by Christians spurred the Roman Popes Julius II, Leone X. Sisto V and Paul V to develop and construct imposing buildings in testimony of the great religious importance of the site. 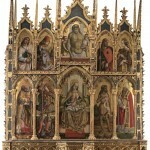 The result is a showcase of work by many of the most celebrated architects of Humanism and Renaissance amongst most Giuliano of Maiano, Baccio Pontelli, Giuliano of San Gallo and Andrea Sansovino. 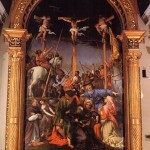 The most appreciated painters collaborated to fresco the sanctuaries’ arcs and walls, Melozzo of Forli frescoed the arc of the sacristy, Luca Signorelli the arc of Saint John, Cristoforo Roncalli known as Pomarancio painted the Treasure Hall. Of great importance is the sanctuaries’ bronze collection manufactured by the famous Lombari work shop. 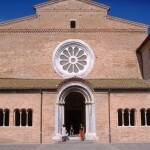 Chiaravalle di Fiastra Abbey. 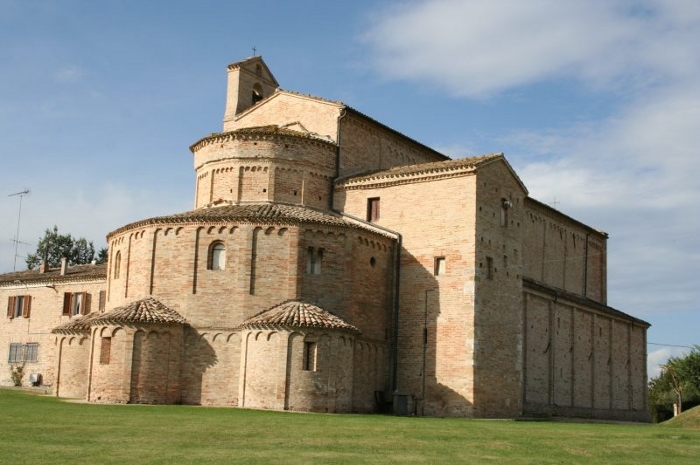 Considered the most important Cistercian monastery in the Piceno , one of the best-preserved in Italy. Founded in the year 1142 by the Duce of Spoleto Guarneiro II, it was constructed on the remains of a Benedictine site of the VIII century. 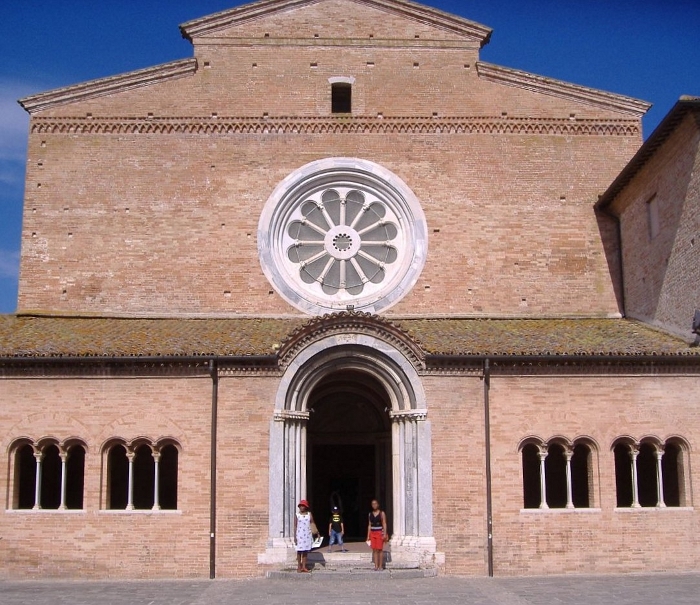 The Abbey has a simple porticoed façade with a Romanesque portal with coupled columns, above a large rose window and a row of small arches, its grandiose interior hosts fresco’s of Marchigian’s school. 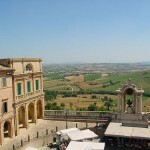 The beauty of the natural marshy wooden land, the hills, the green valley, the riparian fauna and vegetation surrounding the abbey, prompted the Regione Marche to safeguard it by founding the Riserva Naturale Abbadia di Fiastra. 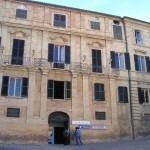 Leopardi House. 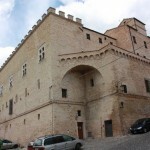 Palazzo Leopardi, an impressive 16 century edifice, lies in the Monte Morello’s district, still inhabited by Leopardi’s descendants. 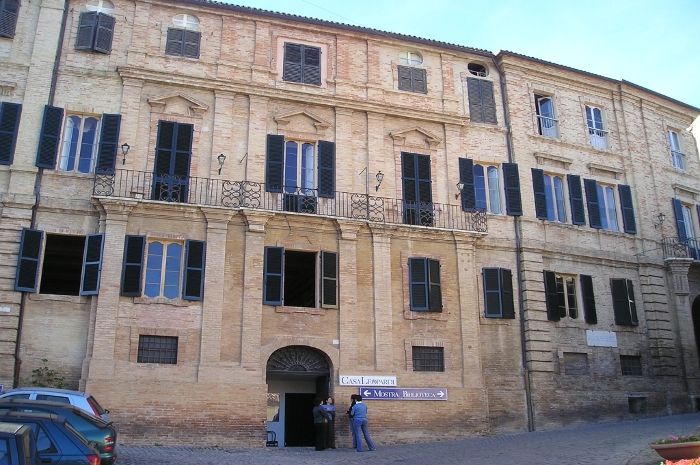 Worth visiting its famous library overflowing with books collected and arranged by Monaldo Leopardi father of the great poet, the museum with its memorabilia and. manuscripts belonging to Giacomo Leopardi. Colle dell’Infinito. 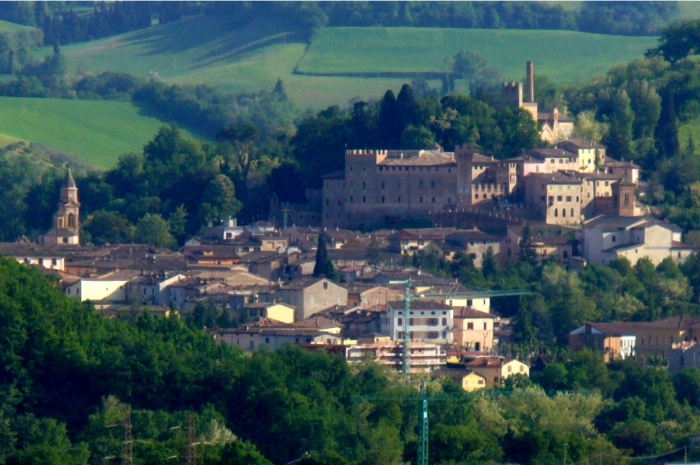 The Monte Tabor is the “solitary hill” sung in the most profound Leopardi’s poem “The Infinite”. 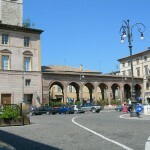 The Mount is dominated by the former monastery of Saint Stephen offers a splendid panoramic view of the Potenza Valley and the hills surrounding it. 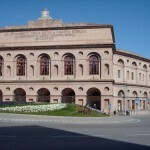 Pinacoteca Civica. 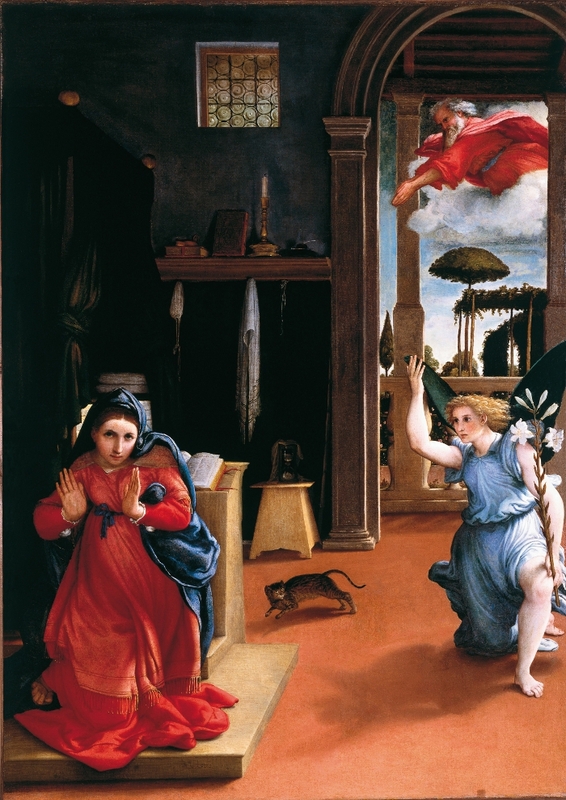 Conserves important master pieces amongst most Lorenzo Lotto’s Transfiguration. 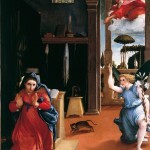 St James and the Annunciation. Urbis Salvia. Urbis Salvia was probably founded in the 1 century B.C. by the Romans for its particular topographical position. Attacked and sacked by the Goths in the V century A.D. it was deserted, the inhabited area was than transferred on the summit of the hill to what now is the town of Urbisaglia, though in the middle ages the city ruins where used as a source of building material, the ancient remains of this Roman city arrived to our days in a fine state of preservation, becoming the most important archaeological document in the Marches Region.